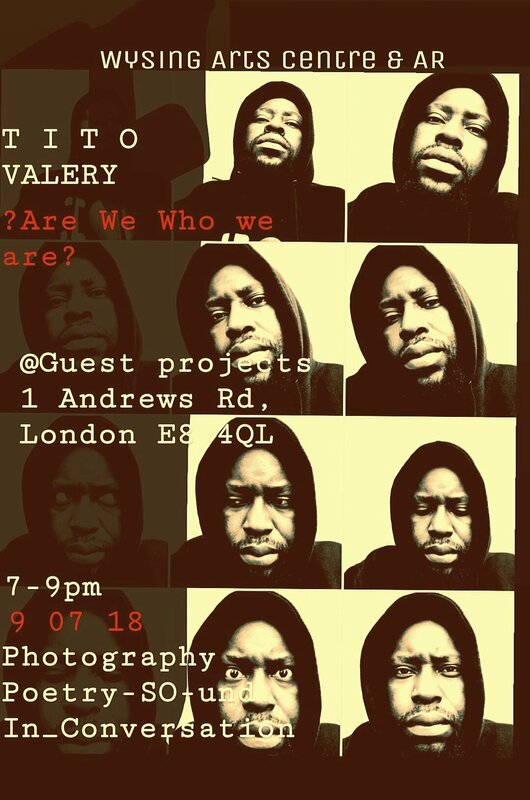 Wysing Art Centre’s first Artist at Risk (AR) Residency artist Tito Valery will be in conversation with artist Harold Offeh at Guest Projects on Monday 9 July. A photographic series and sound piece made at Wysing will be displayed in the gallery and Valery will perform a newly commissioned sound work. Offeh will discuss Tito’s latest work, his personal and political situation, his activism and new research. Whilst in residence at Wysing, Valery has been bringing together voices from the African diaspora through spoken word, a podcast, photography and conversation to explore the realities of the post-colonial impact and political division currently affecting Cameroon. Tito Valery (1982, Cameroon), activist, photographer, public figure and media personality, has written, hosted and directed the socio-political radio talk how W.A.K.A (where African Knowledge Applies) and the television shows Ya'Mo, (To enjoy Africa)), Goodmorning Cameroon, the Break and @W.a.k.a. In December 2017, Valery co-wrote and co-hosted an apolitical wake-up/consciousness awakening radio show with French speaking Rapper & political activist Valsero. Through his work and art, among a broad range of topics, Valery draws attention to social issues and the inequities and oppressive measures of the Cameroonian Government. In 2015, the exhibition The Northern Survivors drew attention to the situation of Cameroonian refugees in the northern part of the country who were fleeing the terrorist group Boko Haram. During the opening of Documenta 14 in Athens 2017, Valery was one of the programmers for Cameroon on the Documenta radio-programme curated by Bonaventure Ndikung of Savvy Contemporary in Berlin. Valery has shown his works and contributed to major festivals and institutions such as Documenta 14, Athens 2017, Performa 17, New York as a co-writer and performer on the TRACEY ROSE SHOW. He has had numerous solo and group shows such as The Northern Survivors, 2016 and Hands, Triangle Ouest group photo exhibition, OFF Dakart Biennale, Villa Ovata Dakar, 2014. In 2014, he was among the ten artists selected for the Asiko curatorial residency hosted by CCA (Centre for Contemporary Art), Lagos. Harold Offeh was born in Accra, Ghana in 1977 and grew up in London, UK. He is interested in the space created by the inhabiting or embodying of history. His work encompasses performance, social practice, video and photography, often using humour as a means to confront the viewer with aspects of contemporary culture and history. He studied at the University of Brighton and the Royal College of Art, London. He lives in Cambridge and works in London and Leeds where he is a senior lecturer in Fine Art at Leeds Beckett University. Offeh is also a trustee of Wysing Arts Centre. Recently Offeh has approached the themes of service and Afro hair culture through collective live engagements with other artists, performers and community participation. He was in residence at Wysing Arts Centre in 2016 and has shown widely both in the UK and abroad. Venues include: Kettle’s Yard, Cambridge, UK; New Art Exchange, Nottingham, UK; Tate Modern, London, UK; Tous, des sangs-mêlés at MAC VAL, Museum of Contemporary Art in Val de Marne, France; Kulturhuset, Stockholm Sweden; Abrons Arts Center, NY USA; The Studio Museum, Harlem, NYC, USA, and Miami Art Basel, Miami, USA. ARTISTS at RISK (AR), led by Perpetuum Mobile (Helsinki-Berlin), is a human rights institution in the field of the arts. The first of its kind in the visual arts, launched in 2013, it has since included musicians, theatre and film-makers. Uniquely, it hosts artists at risk in close cooperation with artistsin-residencies and includes them directly in the curatorial process. Building so-called AR-Residencies across Europe, it is currently also working with new partners in Africa and the Middle-East. With close ties to organisations such as PEN (International, America, Finland, etc. ), SafeMuse or FreeMuse, it stands at the intersection of the fields of the arts and human rights. As a network-institution dedicated to persecuted art practitioners, the work of AR encompasses mapping, hosting and advocacy of art professionals “at risk”, addressing their practical needs and advancing their artistic practice. To achieve this, selected key figures are granted short or long-term residencies at AR-Residencies - not as asylum seekers, but as invited and honoured visiting art professionals. These artists not only greatly enrich their host countries, but are at the heart of rebuilding their often war-torn countries of origin.